Walking up to San Luca, Bologna. 3.5 km of Portico. 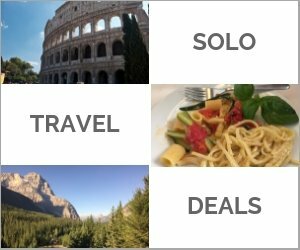 Solo travel in Italy is a wonderful thing. The people are warm. Getting around is easy. And the food! Well, the food is simple and simply delicious. Creating with just a few, high quality ingredients is what makes the food here so special. 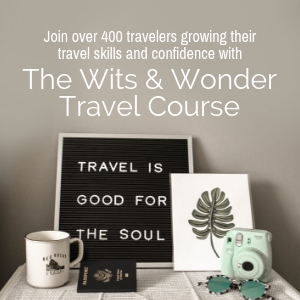 In this post, I will share a few high quality tips which I hope will make your solo travels here special as well. Having been in Bologna and area for three weeks now I, sadly, leave tomorrow. 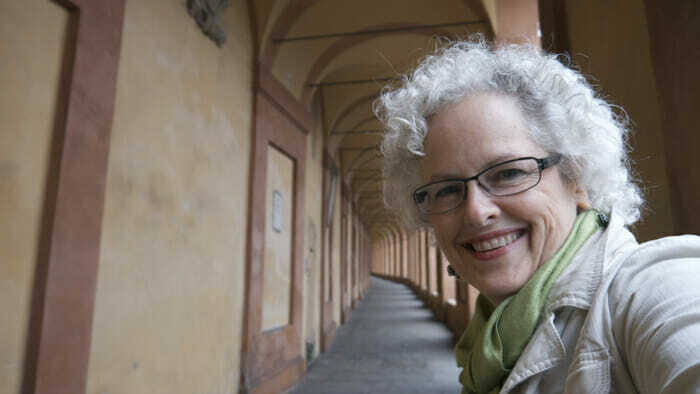 I have already shared three posts with you about my time here – Road Trip: the backroads of Emilia Romagna, Italy, Joy and Balsamic Vinegar: this is what life’s about and, Ciao from Bologna: taking it slow. 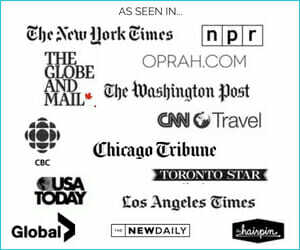 While I have many more stories to share, I am now in a position to offer my 32 Tips – which is something I do when I stay for an extended period of time in any area. The Neptune Fountain is in the Piazza Maggiore, the main square of the city. Stand at the crossroad in this portico (from which you can see the fountain) and turn away from the square. Walk to the restaurant. This is where the more left-leaning locals go for a coffee or aperitivo. Emilia Romagna: a few of the smaller towns worth visiting. Go first to the Piazza Maggiore. This is the heart of the city and it’s where you’ll find the tourist office. Pick up the “Use-it” map. It’s designed for young people but I found that I liked it’s recommendations as well. There are many city museums. Depending on your interests you may want to buy a Bologna Welcome Card which, for 20 Euros gives you 48 hours of access to the city’s museums, a guided tour of the city and discounts at some places. Walk. I don’t just mean walk to get everywhere as I did (I only took public transit to get out of the city) but walk in the evenings. This is what Bolognesi do. They walk, stop for a coffee or maybe a glass of wine, chat with friends and walk some more. The streets are filled with people every night. Feel safe because you are safe. You are always safer in public places. In Bologna, you can feel safe in the evening on the crowded streets I was still cautious, as always, not to get lost on quiet streets. (Because Bologna is a medieval town, it’s easy to get lost). For fresh and often organic vegetables, cheese and meat, go to the Mercato delle Erbe in in Via Ugo Bassi. Explore the older market area which is just off of the Piazza Maggiore and framed by Piazza Maggiore, via Rizzoli, via Castiglione and via Farini. 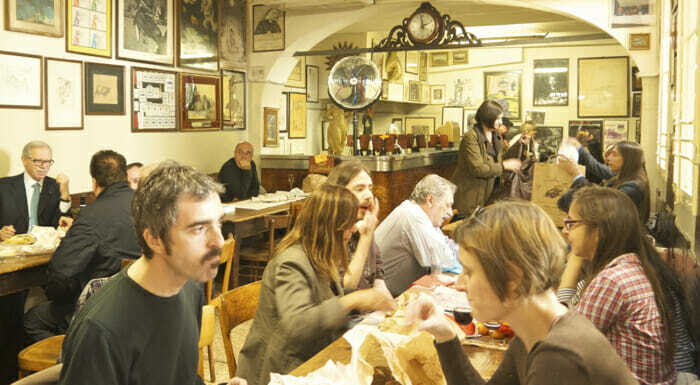 Buy your lunch in the old market and go to Osteria del sole in Vicolo Ranocchi. They only serve wine and beer (no water or soft drinks) so you can bring your lunch, order a glass of wine and enjoy the atmosphere at the communal tables. Make sure that you clean up after yourself. Enjoy an aperitivo in the evening. Many places offer food for free when you buy your drinks. 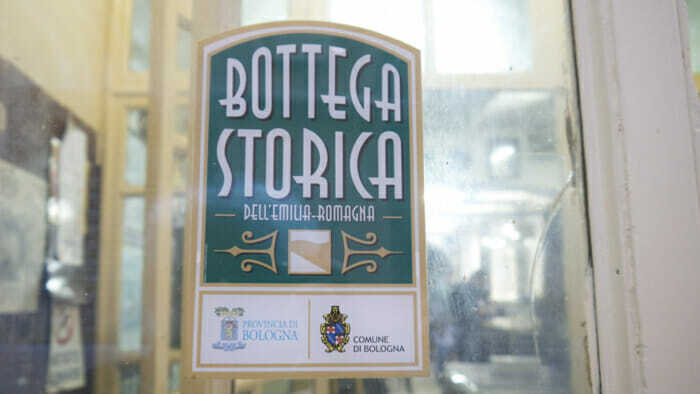 Watch for the Bottega Storica signs in shops and restaurants. They indicate establishments that have a long history which means you’re getting the real thing. This sign indicates an historical establishment. Enjoy the coffee. I was told that locals only have espresso after 11am. Having a cappuccino after that time reveals you as a tourist. 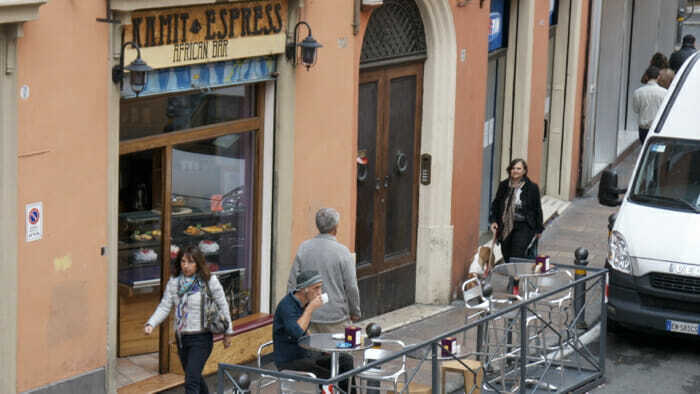 Try out these coffee shops: I went to Kamit Express on the Via delle Moline where the couple who own the place are always serving you with warmth and smiles whether in Italian, English or French. Terzi is closer to the Piazza Maggiore and a little more upscale and a little less friendly. Go for a morning cappuccino and say “hi” to my friends at Kamit Express in the Via delle Moline. 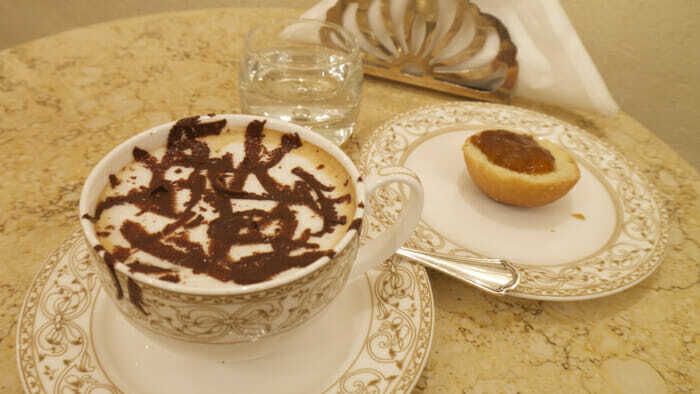 Cafe Terzi is a more elegant coffee shop, lovely but less friendly, at Via Oberdan 10. Make the climb to the Sanctuary of the Madonna of San Luca. It’s a challenging climb if you’re in a hurry but take your time, meander up in about an hour and a half through 3.5 km of porticos and you will be well rewarded by the fascinating church and the view from the top. If you’re here for a while, check out the Cineteca di Bologna as they run many English films with Italian subtitles. The cost is 9 Euros. 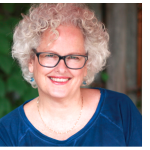 When there I met a wonderful expat woman, her American friend and Italian husband. They invited me to dinner after – which was fantastic. That’s a story to come. Go shopping and experience Italian fashion. Via Luigi Carlo Farini is where many of the high-end shops are located. 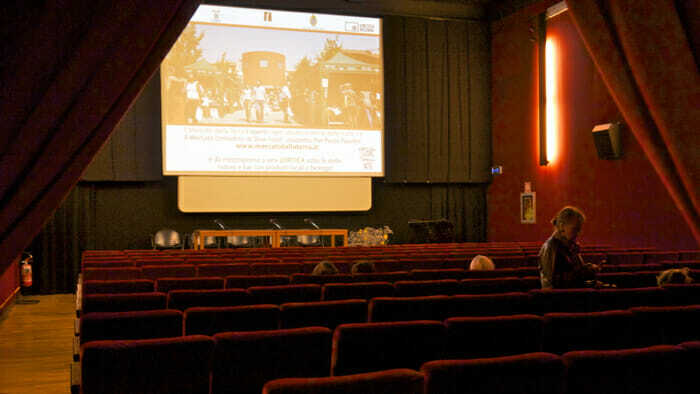 Screening room at the Cineteca di Bologna. 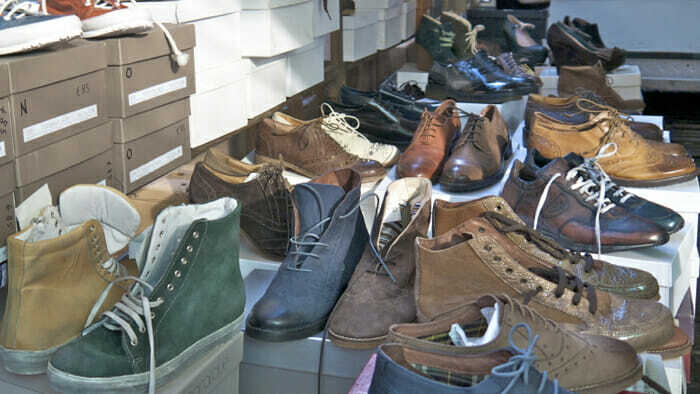 Bologna has both high-end shops as well as the market of new and used clothes. 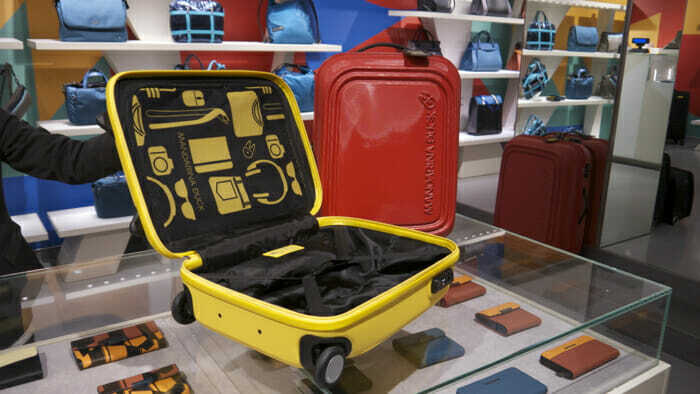 There are even some brands that originate in Bologna like Mandarina Duck luggage and bags. Using Bologna as a base, there are many smaller cities to visit on day trips. 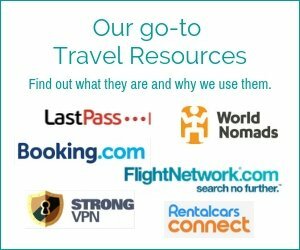 Here are some of the places you may want to visit. Below I describe how to get to them by train. Parma: Arrive early (when the cow’s milk arrives at the Parmesan factories) and you can see how this wonderful cheese is made. Free. 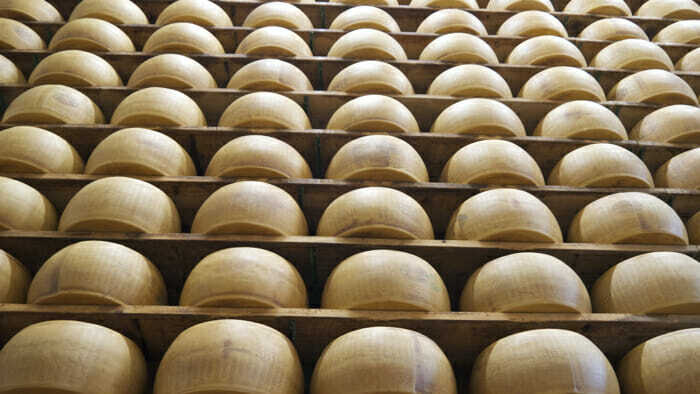 Hundreds of wheels of Parmigiano-Reggiano being aged. 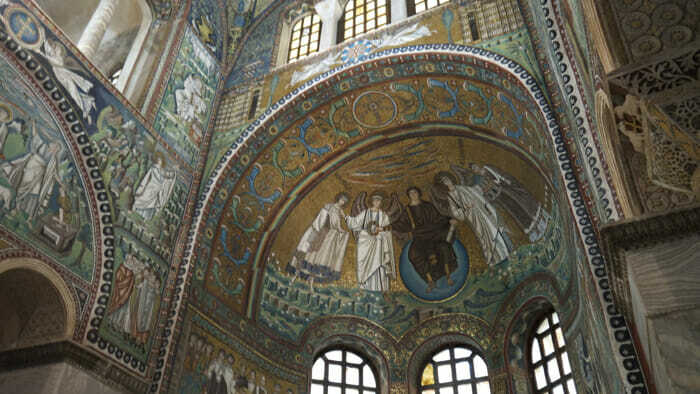 Ravenna: This city has 8 UNESCO World Heritage Sites. It is best known for its fabulous mosaics. Modena: The Ferrari Museum and balsamic vinegar. These are what this town is known for. I’ve already written about the making of Aceto Balsamico Tradizionale here. Comacchio: This small town on a lagoon has an eel festival every year but is also great for walking about, cycling and bird watching. 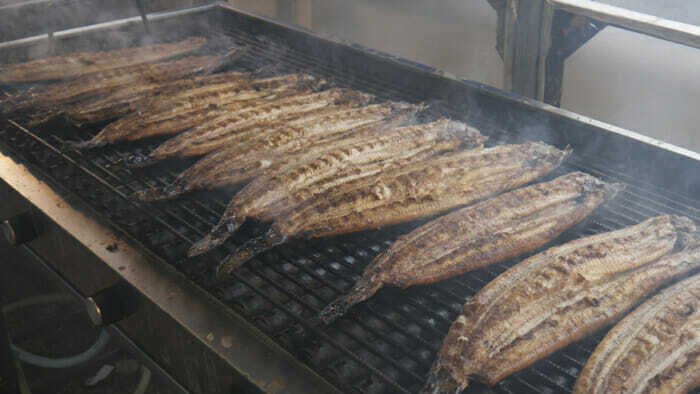 The very small town of Comacchio has an eel festival every year. 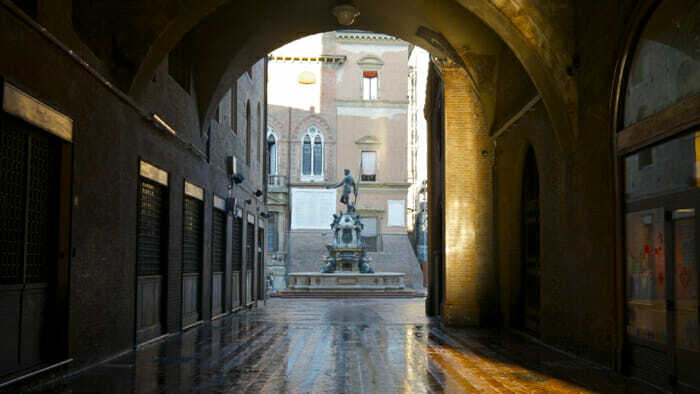 Ferrara: This medieval city has an amazing castle to visit and a vibrant city center. Brisighella: The town of Brisighella only has three thousand inhabitants. Located in a valley, it is quiet and peaceful and surrounded by the most beautiful views. It’s known for excellent olive oil and wonderful Sangiovese wine made by small producers. 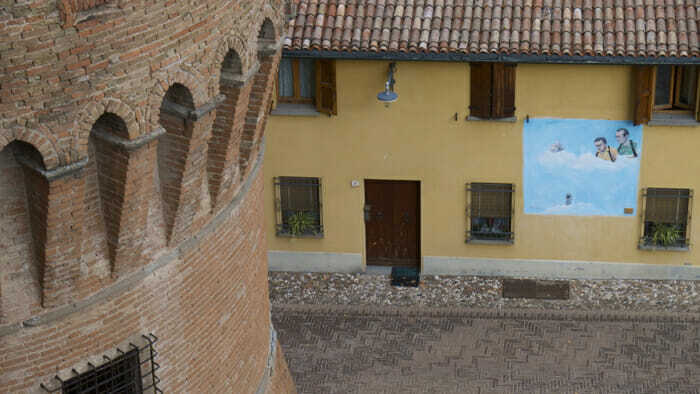 Dozza: another small town that is known for its wall paintings and castle. Definitely worth the detour on a road trip. The train system is a fantastic way to get from Bologna to any of the towns mentioned above. It’s really easy to use and, by my experience, generally runs on time. Here’s how it works. For any of the above towns you’ll be traveling by regional train. And buying at the station is no more expensive than buying in advance online. Check for your train time online. 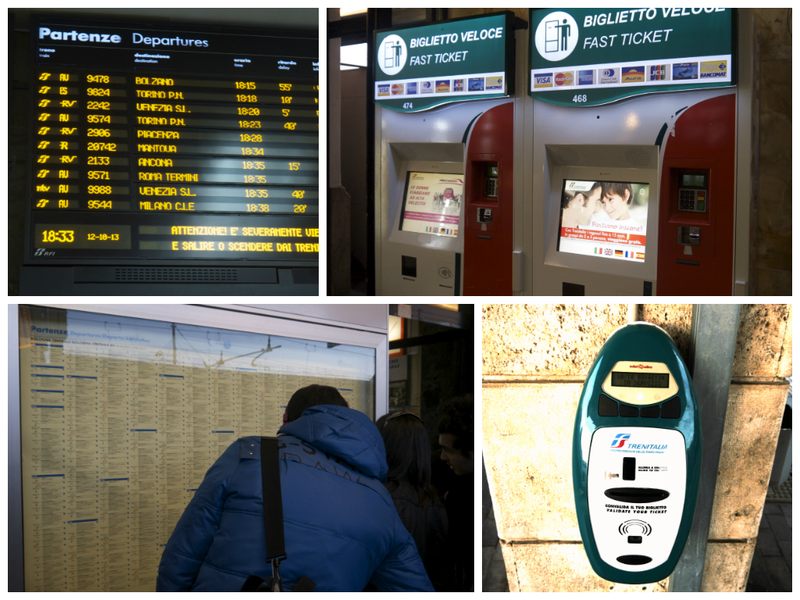 Go to the train station and buy your tickets at one of the automated kiosks. This will be much faster than standing in line. The kiosks are in English – just press the UK flag and follow the instructions. Check the Departures board (which is typically over the doors that go to the train platforms) to determine what platform your train will leave from. If your destination falls short of the final destination of the train, look for the scrolling list of stops it will make to ensure that you’re looking at the right train. Validate your ticket using the machine in the bottom left corner of the image below. If you don’t do this you could be in for a large fine. I missed doing this once, was caught and, thankfully, forbidden. Go to the platform and take a look at the digital sign that indicates where the next train is going. This will confirm that you’re in the right place. Hop on board and enjoy. Running clockwise from the upper left, check the schedule, buy your ticket at the machine if you haven’t done so online in advance, confirm what platform your train leaves from and, make sure your validate your ticket with this little machine on walls throughout the station. My thanks to the tourism board here for supporting Blogville – a place for bloggers to stay while exploring the region. 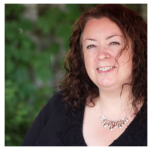 You can read what other bloggers have written about their stay here. Get lots more on the Emilia Romagna region from this ebook.